Two very cute houses located a short distance from town, beaches & westside. Great for investment properties, or owner with tenant in second house. 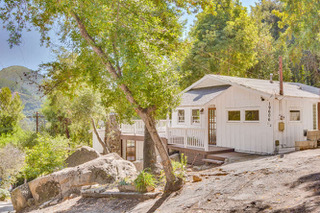 Peaceful area with pine trees, lilac, garden areas, exposed bedrock, and mountain views. Multiple decks, wood floors and high beamed ceilings. Each house has it’s own yard and parking. To view more photos please click here.